Vincent travels to Microbiotix, Inc, a biopharmaceutical company in Worcester, MA to speak with four members of the company about their discovery and development of small molecule drugs that target serious infectious diseases. The TWiVosophers review the Chinese plasma virome revealed by non-invasive prenatal testing, and a new filovirus genome from bats in China. 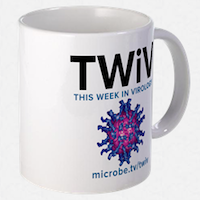 In the first episode for 2019, the TWiV team reviews the amazing virology stories of the past year. The TWiV hosts review persistence of Ebola virus after the end of the Liberian outbreak, and the potential role of two herpesviruses in the pathogenesis of Alzheimer’s disease. At the Medical College of Wisconsin, Vincent talks with current and former members of the Department of Microbiology and Immunology about their work and their careers. Vincent speaks with Sandy Weller about her career and her work on the mechanisms of synthesis, maturation, cleavage and packaging of viral DNA genomes. Scott Tibbets joins the TWiVists to describe his work on the role of a herpesviral nocoding RNA in establishment of peripheral latency, and then we visit two last minute additions to the Zika virus literature. Greg Smith joins the TWiVirate to reveal how his lab discovered a switch that controls herpesvirus neuroinvasion, and then we visit the week’s news about Zika virus. A swarm of virologists discusses testing of a MERS coronavirus vaccine for camels, and how a neuronal stress pathway reactivates herpes simplex virus.